I sometimes design printed fabrics, and just about every textile manufacturer I have worked for has some variation of a gingham check on their best-seller list. Since this classic design theme has such widespread appeal, I thought it would be nice to create a crocheted version of a traditional gingham check pattern. While you'd normally think of a gingham as being a lightweight cotton or cotton blend fabric, I chose to crochet my new version in acrylic baby yarn. I designed this baby blanket especially with baby boys in mind. If you change a detail or two -- the size, and / or the colors -- it could work well for people of all ages and both genders. When crocheted in the colors shown, and made in a crib size or twin size, the afghan could accompany the little boy well into childhood as he grows up. The choice is yours; I've included multiple sizes so that you can choose which one you think will work best for the recipient you have in mind. You can substitute other colors or brands of yarn. Receiving Blanket Size: This is the version pictured in the photo above. The blanket is 3 squares wide by 3 squares high. The receiving blanket is the smallest size; if you crochet squares measuring 10.5 inches each, your blanket will measure approximately 31.5 inches square before you add the edging. The edging you choose will affect the final measurement of the blanket. Crib Size Blanket: The crib sized blanket is 3 squares wide by 5 squares long for a total of 15 squares. If your squares each measure 10.5 inches, your blanket will end up being approximately 31.5 inches wide by 52.5 inches long before you add the edging. Twin Size Blanket: The twin size blanket is 6 squares wide by 8 squares long for a total of 48 squares. If your squares each measure 10.5 inches, the twin size blanket will measure approximately 63 inches wide by 84 inches high before you add the edging. Other Sizes: Feel free to make this blanket in other sizes if you like. There are several ways you could change the size. One is to simply crochet more (or fewer) squares. The other is to work at a different gauge; you could use different yarn and/or a different crochet hook to achieve significantly different results. Receiving Blanket Sized Afghan: Make 5 of the blue and white squares; make 4 of the white and blue squares. Using whip stitch, or the seaming technique of your choice, sew the squares together to create the main body of the baby afghan. Refer to the photo above for placement; you'll alternate the squares, placing blue and white squares in each outer corner. When you are finished joining the squares, skip to the edging instructions below. Crib Sized Afghan: Make 8 of the blue and white squares; make 7 of the white and green squares. Using whip stitch, or the seaming technique of your choice, sew the squares together to create the main body of the baby afghan. When you join your squares, refer to the crib-sized afghan placement diagram. ​You'll alternate the squares to form a checkerboard of checkerboards, as shown on the placement diagram. When you are finished joining the squares, skip to the edging instructions below. Twin Sized Afghan: Make 24 of the blue and white squares; make 24 of the white and green squares. Using whip stitch, or the seaming technique of your choice, sew the squares together to create the main body of the baby afghan. When you join your squares, refer to the ​twin-sized afghan placement diagram. You'll alternate the squares to form a checkerboard of checkerboards, as shown on the placement diagram. Then add an edging as noted below, or the edging of your choice. Baby Afghan Edging: I recommend using a simple edging to finish off this blanket, especially if you are making the blanket for a boy. For my project sample, I used a no-fuss single crochet edging around the outside of the blanket. 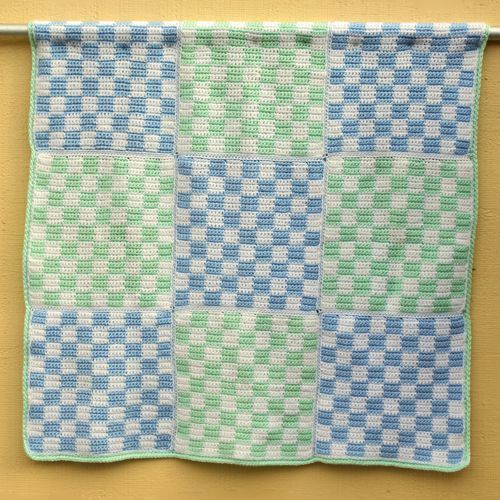 This diagram accompanies the free pattern for a gingham check baby afghan; you can use it to see how to arrange your squares when you join them together to make your finished blanket. This pattern is available in several sizes; the diagram you see here is for the crib-sized version of the blanket. Instructions are also available for making receiving blankets and twin-sized blankets as well. To do the joining, you can use whip stitch or the joining method of your choice. Here we have a close-up picture of a bunch of the checkerboard baby afghan squares you'll use to make the gingham check baby blanket. I find checkerboards simply fascinating; they're one of my favorite design themes. I use them often when designing baby blankets and other crochet projects. This chart accompanies a free crochet pattern for a gingham check baby blanket. There's another coordinating chart in white and green that is also part of the baby blanket design. You are welcome to adapt this chart for other uses if you like; there are many ways to use it in other crochet and needlework projects. The instructions given below will help if you plan to make the gingham check baby afghan. Yarn: You'll need two contrasting colors of yarn. If you want your squares to turn out the same size as mine did, I recommend using yarn that is a size 3 on the Craft Yarn Council's standard weight system. To crochet my sample square, I used Bernat Softee baby yarn in pale blue and white. Crochet Hook: I used a size H crochet hook to crochet my sample squares. This might or might not be the hook size you'll need; you can use it as a starting point and then adjust as necessary to achieve the correct gauge. 1 square = 10.5" square. If your squares do not turn out totally square, that's OK, but it means that your blanket will not be exactly the same size stated in the pattern. I recommend that you measure your first square carefully and then do a quick bit of math to make sure you'll end up with a blanket that meets your needs. Just multiply your square's width by the number of squares needed across (receiving blanket size = 3; crib size = 3; twin size = 6.) Then multiply your square's height by the number of squares needed down (receiving blanket size = 3; crib size = 5; twin size = 8). Those will be the approximate dimensions of the blanket before the edging is added; the edging will add a bit more onto the actual finished size of the blanket. If your square turned out way too large or way too small, you'll probably want to try again with a different crochet hook. Design Notes: You'll work this pattern in sc st using the tapestry crochet technique. Between rows, use a turning chain of 1 st. Using blue yarn, ch 46. Sc in 2nd ch from hook. Follow the chart above to crochet the checkerboard pattern using the tapestry crochet technique. You'll want to carry your inactive yarn color so that you are crocheting over top of it as you go. I recommend carrying your white yarn from the very beginning. Then you can just pick it up when you need it. If you are not familiar with this technique, you may wish to take a look at my tapestry crochet tutorial to see pictures and step-by-step instructions for how to do it. When you are finished working the chart, end off and weave in your ends. This chart accompanies a free crochet pattern for a gingham check baby blanket. If you would like to crochet the baby blanket, you'll also need the coordinating blue and white chart. You are welcome to use either of these charts for other purposes if you like; there are many ways they could be used in other crochet and needlework projects. The instructions given below will help if you plan to make the gingham check baby blanket. Yarn: You'll need two contrasting yarn colors. If you want your squares to turn out the same size as mine did, I recommend using yarn that is a size 3 on the Craft Yarn Council's standard weight system. In my project sample, I used Bernat Softee baby yarn in mint, which is a pale green color, and white. Crochet Hook: Size H, or size needed to obtain the correct gauge. It's fine if your squares do not turn out totally square, although it means that your blanket will not be exactly the same size stated in the pattern. I recommend measuring your first square and then doing a quick bit of math to ensure you'll end up with a blanket in a useable size. Just multiply your square's width by the number of squares needed across (receiving blanket size = 3; crib size = 3; twin size = 6.) Then multiply your square's height by the number of squares needed down (receiving blanket size = 3; crib size = 5; twin size = 8). Those will be the approximate dimensions of the blanket before the edging is added; the edging will add a bit more onto the actual finished size of the blanket. Using white yarn, ch 46. Sc in 2nd ch from hook. Follow the chart above to crochet the checkerboard pattern using the tapestry crochet technique. You'll want to carry your inactive yarn color so that you are crocheting over top of it as you go. I recommend carrying your green yarn from the very beginning. Then you can just pick it up when you need it. If you are not familiar with this technique, you may wish to take a look at my tapestry crochet tutorial to see pictures and step-by-step instructions for how to do it. Here's a close-up work-in-progress picture of the baby afghan squares being joined. I used whip stitch to do the joining. There are quite a few other joining techniques you could use; feel free to explore other options if you'd prefer to use a different method.